Fast, professional plumbing and water treatment service. - 1000 Islands Water Treatment & Plumbing Inc. : 1000 Islands Water Treatment & Plumbing Inc.
1000 Islands Water Treatment and Plumbing Ltd. delivers. This article was written for the Brockville Recorder and Times by by Leisa Price-Storey, Freelance Writer. It was published on February 23, 2009. In February 1992, with one vehicle and, plenty of determination and confidence, he opened his first business, Rick Harmsma Plumbing. A few years later, he took on a new venture/partnership – 1000 Islands Water Treatment – with a friend. Eventually he bought out his partner and merged the two businesses as 1000 Islands Water Treatment & Plumbing Ltd., a company that offers a wide range of services, including installing plumbing in new homes and repairing leaky faucets, complete bathroom renovations, installing pumps and pressure systems and well upgrades. “We offer all types of water treatment systems that give your family safer, softer, cleaner, better-tasting water,” says Harmsma. The company provides a free in-home water analysis service. “From these tests, we can recommend the right equipment to do the job to treat your water,” he explains. Today the business has grown from a one-man enterprise to four full-time professionals in plumbing and water treatment, one full time office person and three vehicles. “Over the years we have been blessed with the addition of some dedicated staff and caring employees who have helped make our business prosper,” says Harmsma, who now has 33 years of plumbing experience under his belt. His wife, Sylvia, the full-time office person, is in charge of the books and keeps the staff on schedule. Terrie Crouse, skilled in plumbing, carpentry, and all types of renovation projects, has been with the company for eight years. Tim Harmsma, Rick & Sylvia’s nephew has been employees here for five years and is very competent and skilled in all aspects of the plumbing trade. The newest employee, Dan Warneford, is avidly learning the ropes and finishing up his first successful year with the business. 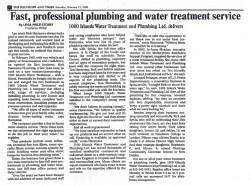 What keeps 1000 Islands Water Treatment & Plumbing Ltd. customers satisfied is the company’s strong work ethic. “We don’t believe in cutting corners,” notes Harmsma. “We believe in quality workmanship. We give our best and it’s done right the first time,” and they always strive to meet their customers’ expectations. “We have excellent warranties to back up our products and we service what we sell. Financing is available on approved credit,” notes Harmsma. 1000 Islands Water Treatment and Plumbing Ltd. has served thousands of satisfied residential, commercial and industrial clients in a wide territory ranting from Kingston to Iroquois and Ottawa and surrounding area. Many clients are repeat customers who have come to true and rely on the expertise offered by the company. In 2002, Jo-Anne Fletcher, Executive director of the Mallorytown Residence Support Program, required the service of a water treatment facility. She chose 1000 Islands Water Treatment and Plumbing Ltd. over several other business and ever since has relied on “his friendly, timely and professional service,” she says. Besides keeping their family business running smoothly and successfully, Rick and Sylvia, who will be celebrating their 25th anniversary this June, are also kept busy raising their active family. Their oldest daughters, Serena, 20, and Ashley, 19, are both students at Fanshawe College in London. Fifteen-year-old son Dustin is in Grade 9 at Athens District High School. And their younger daughters, Stephanie, 8, and Alyssa, 6, attend Heritage Community Christian School in New Dublin. For any or all of your water treatment or plumbing needs, give 1000 Islands Water Treatment and Plumbing Ltd. a call at 613-342-5451. Regular office hours are Monday to Friday from 9 a.m. to 5 p.m. and calls are answered 24/7 for after-hours emergencies.